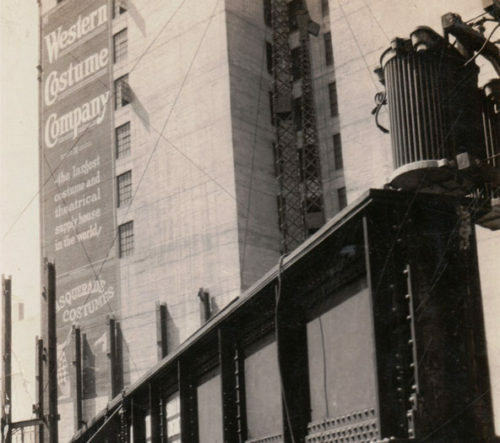 Western Costume’s early home in downtown Los Angeles may still wear its sign on its facade—albeit one that is completely hidden from view. Theater continues. The huge balcony girder shown here is 91′ long and 6′ tall. I received an exciting message the other day from a woman named Kathy Bjorklund, whose great-grandmother had a set of photographs of the construction of the United Artists Theater. The United Artists Theater, currently known as the Theater at the Ace Hotel, is located on S. Broadway in downtown Los Angeles, between 9th and Olympic—and it just so happens to be adjacent to one of the first buildings to house Western Costume Co. The photos were taken by a relative of Kathy’s who was an ironworker, and most appear to show the Baker Iron Works where the iron was fabricated. One photo, though, was taken on site, and the neighboring Western Costume building is visible behind the construction. 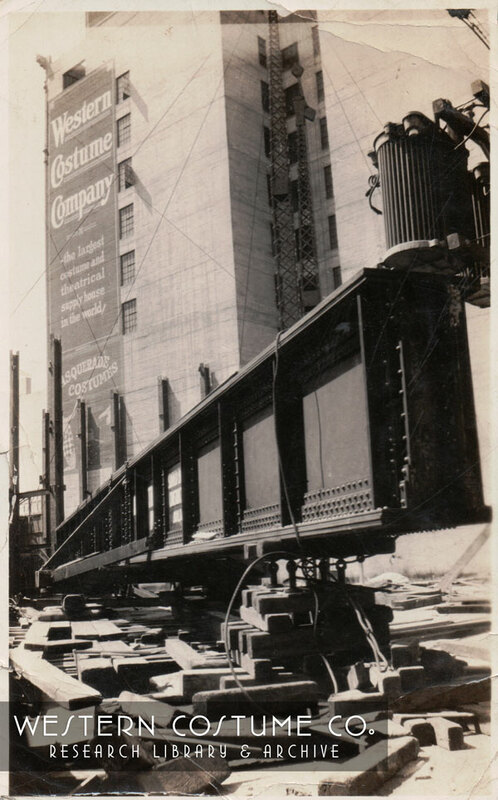 This is the only photo I have ever seen of the north face of the Western Costume building; the much taller United Artists Theater was erected less than two years after it was, so there was only a short period of time in which that side was visible. The most interesting thing about this photo, though, is the implication that the massive Western Costume sign painted on the building still exists. Unfortunately, although both buildings still stand on Broadway, there is no space between them; even if the sign is preserved, it is completely concealed. 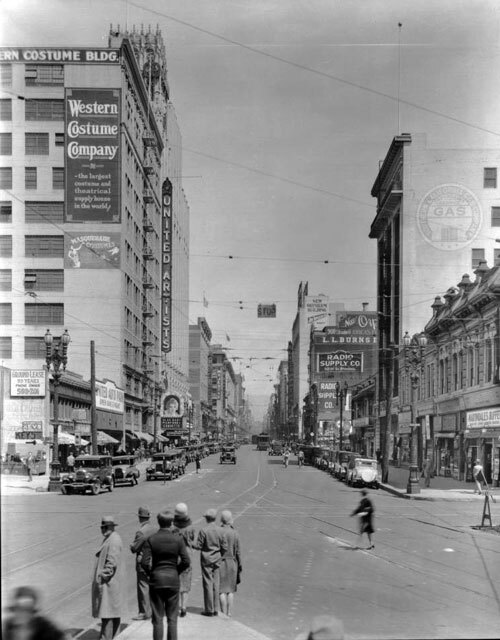 Looking north on Broadway from 10th St.
From the California Historical Society Collection at the University of Southern California. By 1923, Western Costume Co. was the largest costume rental house in the world, responsible for 99% of the costume business in the burgeoning film industry. With more than 150 employees, it had outgrown its space in the small Burns Building at 908 S. Broadway, and arranged to lease a soon-to-be-built, 13-story building across the street at 939 S. Broadway. The new building was completed at the end of 1924, and featured a drive-on elevator that would take cars to the rooftop parking lot. In the 1920s, Broadway was the hot spot for movie theaters in Los Angeles. This location was the obvious choice, then, when Mary Pickford, Charlie Chaplin, and the other partners of the United Artists studio decided to build one of their own in 1927. They purchased the lot directly north of Western Costume, and in May of that year, 5,000 people crowded the street for the groundbreaking ceremony, hoping to catch a glimpse of the celebrity participants. Construction, which is beautifully documented in Bjorklund’s photos, lasted through Christmas, and the theater opened on December 26 with a screening of Mary Pickford’s latest film, My Best Girl (1927). Within a few years Western Costume Co. relocated to Hollywood, which had established itself as the center of the filmmaking business. It operated out of a building on Melrose adjacent to the Paramount studio lot from 1932 until 1989, when it moved to its current location in North Hollywood. The United Artists Theater closed after a post-World War II slump in ticket sales. Texaco, then later various other businesses, leased the offices in the rest of the building. In 1989, preacher Gene Scott took over the theater for his Los Angeles University Cathedral services. The Ace Hotel purchased the property after Scott’s death in 2005, and undertook a massive, much-needed renovation. In 1979, a 6-block stretch of Broadway was added to the National Register of Historic Places as the “Broadway Theater and Commercial District.” At the time, the listed area ended one block shy of the Western Costume Building and United Artists Theater. However, in 2002, the boundary was increased one block on either end, meaning that both buildings are now deemed worthy of preservation for their historical significance and will hopefully be around for years to come—even if it means we will never know whether the sign is still hiding between them. Had Kathy not reached out, we would likely never have known about this hidden bit of history. I am so grateful that she thought to contact our archive. Too often, people fail to realize the value that old ephemera may hold. It’s easy to become overwhelmed when facing boxes or houses or storage units full of inherited mess, but I beg you not to reach for the nearest garbage bag! In a previous post, I included an image from a pamphlet I found among my grandmother’s 4-H papers. It had no personal meaning to my family and would likely have been tossed had I not gotten a message from someone who’d been looking online for that very brochure because it contained a picture of his grandmother’s family. In fact, after every blog post I have made—no matter how esoteric—I have inevitably received a message from someone who is somehow connected to someone or something I’d written about. Whether it’s a 1920s restaurant menu, your great-aunt’s wedding photo, or the negatives from your middle school graduation, don’t just throw it out! There are easily accessible resources that may be able to help you find the right home for old photos, documents, or other ephemera. Look up archives or museums that may have a relevant collection; find Facebook groups or online communities related to your material; reach out to local libraries or historic societies. Even posting on Instagram with the right hashtags could potentially connect you with the right person. If you prefer to sell, look for auction companies who specialize in the appropriate area because they will have the right customer base. Or list on Ebay, where you’ll have a wide audience. Even if you plan to keep your finds, consider scanning and sharing the digital files. If you’d like to donate to our library, see the Submissions page for information about what we collect, or contact us. “Firm to Raise New Structure.” Los Angeles Times, July 24, 1923, II1.